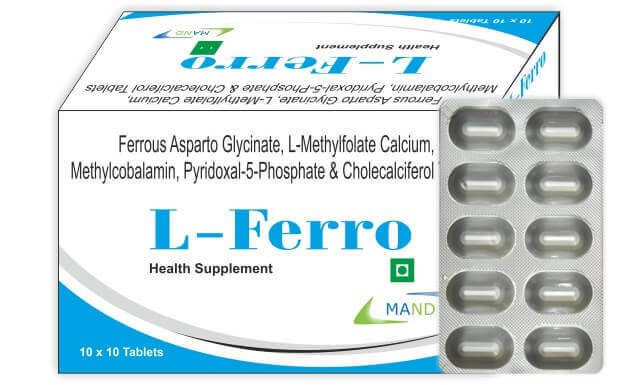 We are manufacturing Ferrous Asparto Glycinate, L - Methyl Folate, Pyridoxal - 5 Phosphate, Mecobalamin & Vitamin D3, Tablet - combination as health supplement. For those consumers who are anaemic especially women's and not able to take a balanced diet with recommended serving of fruits and vegetables due to their hectic life style and untimely food habits and not eating enough foods. These nutrients are needed by the body for the formation of red blood cells. If the body does not receive adequate amounts of these nutrients, anaemia can develop. Supplement users tend to adopt other healthy habits such as engaging in physical exercise, trying to eat a healthy diet, seeing a physician regularly - suggesting that supplement use is an integral part of an overall interest in wellness. This product is versatile, high – potency Iron with essential nutrients formula as the primary dietary supplement for all types consumers especially women – childbearing age should maintain adequate level of iron and nutrients either through diet or supplements to used in pregnancy. ●Building blood and other cells and tissues. All dietary iron has to be reduced to the ferrous form to enter the mucosal cells; therefore ferrous iron is absorbed three times more readily than the ferric form. Moreover, ferrous asparto glycinate is also a chelated iron. It is better tolerated and absorbed compared to other forms of iron, allowing for lower iron dosing. The family of B vitamins, which are also known as B complex vitamins, plays an important role in converting food into energy and helping the body metabolizes fats and proteins. The B vitamins are also important for healthy hair, skin, liver, and eyes. Vitamin B6 or pyridoxine, is one in this group of eight vitamins. It is also involved in the production of hemoglobin, intrinsic factor, and is a vital component in the formation of the myelin sheath that surrounds nerve cells. Prevention and improvement of peripheral nerve damage in certain health conditions. These conditions include diabetes, multiple sclerosis, and those caused by chemotherapy for various neuropathies, including peripheral neuropathy and diabetic neuropathy. Folate is a form of B vitamin that occurs naturally in many foods. Folic acid is the man-made form of folate that is added to processed foods or vitamin and mineral supplements. Folate is needed in the human body for production of red blood cells. A lack (deficiency) of folate in the human body can be caused by certain diseases, by taking certain medications, or by not getting enough folate in your diet. Folate deficiency can lead to decreased red blood cells, or anemia. Folate deficiency can also cause high levels of a certain amino acid in the blood, a condition called hyperhomocysteinemia (HYE-per-HOE-moe-sis-tin-EE-mee-a). L-methylfolate is a medical food for use in people who have conditions related to folate deficiency. L-methylfolate is also used in people with major depressive disorder who have folate deficiency, or in people with schizophrenia who have hyperhomocysteinemia related to folate deficiency.